After requesting a trade away from Adelaide just two days after the season ended, Mitch McGovern was always expected to leave the Crows during the offseason. The biggest question was to where – a question answered about a month later when he tabbed the Blues as his future home. Mitch McGovern has shown the potential to be an undersized key position forward, but at 191cm he’s a bit small to be a true contested marking target. Like his ex-teammates in Lynch and Walker he covers the ground well, and he flexibly slots into structures that demand he play a bit taller or a bit smaller. There’s some thought amongst the Adelaide crowd that he performed a little better without the similar Walker – something that bore out a little in a very small sample size, and is about to get tested in full. McGovern will turn 25 next year (he turns 24 tomorrow), so he’s is not likely to get dramatically better from here. History tells us a player around his level of recent output is about as likely to improve as to fade away, either due to performance or injury related reasons. His injury record is the primary concern here. In two of his three senior seasons he has missed about half the year, with multiple hamstring issues last year and ankle issues this year. 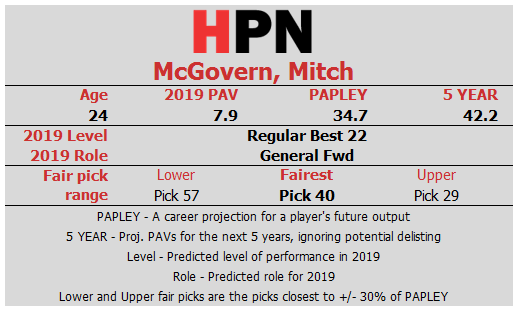 PAPLEY has him producing another 35 PAV as an average outlook, something which is a bit over three of his best season so far in output. The other concern is that with Walker, Lynch, Betts and Jenkins in the same forward line McGovern was well placed as at least a third-order threat in Adelaide’s forward line. Can he thrive as a medium-tall player when far more exposed at Carlton? If he gets his body right and finds a role at Carlton he’ll likely outperform this projection just by playing more games, but for evaluating the trade, an injury history and the prospect of fading due to a role change is the sort of risk discount PAPLEY is designed to incorporate. Shane McAdam is the second of Carlton’s freebie mature age non-drafted players, and we discussed the valuation of those yesterday. Essentially he’s valueless except for what clubs are willing to pay for him, and we’ll get to that in a moment. McAdam is 23 year old originally from the remote East Kimberley in West Australia and comes via the WAFL, Adelaide amateur footy and most recently Sturt in the SANFL. He was in the draft frame in 2015, and equalled Nic Naitanui’s then-combine record of 102cm in the running vertical jump at the State combine, and finished close to best nationwide in the 20m sprint and standing vertical jump. He’s a 181cm small/medium forward with a good state league goalkicking record who also applies a lot of forward 50 tackle pressure. The Crows will like his chances of slotting immediately into a formidable setup where he, like McGovern, would be far from the focal point. Unfortunately, we don’t have the data to project from the state leagues yet, but his raw numbers and vision show a promising player. On the face of it, both main clubs lose substantial value to the Swans via their pick brokerage. The wildcards are of course the two players – Carlton and Adelaide both would rate McGovern’s future output higher than projected here, and Adelaide presumably think they’ll get value out of McAdam as well. Carlton now have pick 1 and then pick 43 in the draft, having shed two pretty useful shots at talent in the still-lucrative 20s range, for one established but slightly injury prone player. They need McGovern to perform roughly as he has for his last two half-seasons, but play at least three full seasons at that level, to make this deal carry value for them. That’s certainly quite plausible, but even then, Carlton gave up McAdam who is being projected at zero here. The trade still may not look like a great move in hindsight if the Crows get much out of McAdam on the other side of the ledger. For Adelaide, the obvious upside is the basically valueless McAdam. The 16 PAV “loss” for them also represents an implicit valuation of him and is well in line with the value of past mature age concession players at the trade table. If they get some solid footy out of McAdam they’ll do fine here. Sydney, as mentioned, made a pick swap with both parties and have done extremely well for themselves. Picks 26, 28 and 40 are, simply put, a better draft hand than pick 13 alone when viewed purely as live selections. The gain in academy bid matching terms is smaller than in the PAV value of the selections because AFL Draft Value Index discount second round picks more severely. However, the Swans have still made a 50% gain, and turned pick 13 into the bid-matching equivalent of pick 5. Verdict: Unfair trade for Carlton even if McAdam has no value, Unfair trade in favour of Sydney. Fair for Adelaide.